California won’t be adopting single-payer healthcare with its $400 billion price tag any time soon. Assembly Speaker Anthony Rendon made sure of that by opposing it. But the healthcare system is ailing, and organized labor, healthcare advocates and several Democratic lawmakers are offering a new prescription in the form of several bills. The measures could provide a bridge to a single-payer system in the future. 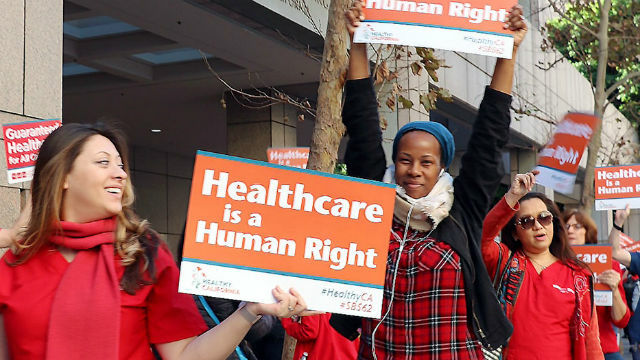 “Universal coverage is within our grasp,” Anthony Wright of Health Access California, the leading proponent of the package, said at a press conference at the state Capitol last week. The measures are intended to rein in healthcare costs, fend off Trump administration efforts to undermine Obamacare, provide lower-income Californians with greater access to care, and reduce pressure on Democrats to embrace the costly single payer concept. The overall cost is yet to be determined. Backers say they hope to deliver them to Gov. Jerry Brown’s desk for his signature in the final months of his tenure. It won’t be easy. Measures that would cost money—and any significant bill would—probably would need to be approved before the deadline for adopting a new budget, July 1. The announcement comes a week after Covered California, which oversees the Affordable Care Act in this state, reported that healthcare premiums for some Obamacare customers could rise as much 35 percent by 2021. Separately, a report produced earlier this week as part of an Assembly inquiry into healthcare said 21 percent of Californians who have health insurance are considered under-insured, and cannot afford out-of-pocket healthcare expenses. There are, for example, people earning $30,000 a year who have insurance policies requiring them to pay annual deductibles of as much as $6,000 — an impossibility. The proposal includes bills to provide greater subsidies for middle-income earners who rely on Obamacare and help them pay for prescriptions. Other measures would attempt to regulate health insurance company profits, including one by Assembly Health Committee Chairman Jim Wood, a Democrat from Healdsburg, to impose greater oversight when healthcare providers want to merge. A bill by Senate Health Committee Chairman Ed Hernandez, a Democratic from Covina, aims to prohibit the sale in California of the low-cost short-term insurance policies, a concept that would undercut an idea pushed by the Republican-controlled Congress and President Donald Trump. Democrats dismiss such policies as junk because they failed to provide basic coverage. Wright said the coalition, which includes organized labor, consumers, immigrant advocates and groups such as Planned Parenthood, is advocating a state-only individual mandate, intended to compel people to buy health insurance. Such a bill likely would require a two-thirds vote of the Legislature. Congress abolished the federal mandate that had been part of the Affordable Care Act. A goal would to be expand coverage to include more undocumented immigrants. The state already provides healthcare coverage for all children, including about 225,000 who are undocumented. Sponsors hope to extend that coverage, at a minimum, for undocumented individuals up to age 26, and to elderly people. Insurance companies and many business groups surely will oppose most if not all the bills as too costly and burdensome. From the left, the California Nurses Association is skeptical of the package. The union is a leading advocate for replacing our existing private insurance with a single-payer system, funded by taxpayers and administered by the state—and is an aggressive political force that pushes Democratic candidates to embrace it. Chuck Idelson, the union’s spokesman, said the union supports expanded coverage for undocumented immigrants, but called the proposal “fragmented” and said it would reinforce an insurance-based system that depends on profits. “The leaders of California are sitting on their thumbs or taking half steps,” Idelson said. On Thursday, Lt. Gov. Gavin Newsom, who has made a point of backing single payer in his Democratic bid for governor, was quick to issue a statement calling the package “a step in the right direction” toward universal coverage. Democratic politicians worried about attacks from the left see the new package as a way to show voters, who are increasingly concerned about healthcare, that they are acting. No matter what comes of the roughly 20 bills, whoever becomes the next governor will need to grapple with healthcare coverage, costs, and the politics of it all.